If you are one of the many Maple Grove denture wearers, you know that they are not the ideal solution for missing teeth. 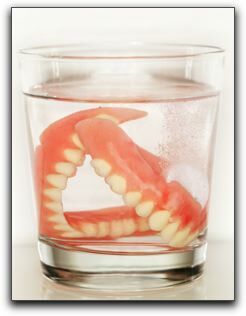 The problems with dentures include slipping, gum irritation, trouble eating and talking, bone loss, and inability to taste food due to a covered palate. Clearly, dentures do not feel or function like natural teeth. How about a thick T-bone at your favorite Maple Grove steakhouse? In addition to being able to enjoy your meal, you will avoid the embarrassment of having your dentures rattle around in your mouth in public. Before you pay for another denture reline, ask your Maple Grove dentist about the possibility of dental implants. Attention Maple Grove denture wearers: there is life after dentures with tooth implants! Come see us at Arbor Lakes Dental at 12000 Elm Creek Blvd, Ste 230 in Maple Grove, 55369 for more information about dental implants.